Have you ever felt like you were driving through your life or your career with the emergency brake on? It feels as if no matter how hard you work at something, you’re simply not progressing as quickly as you’d like? 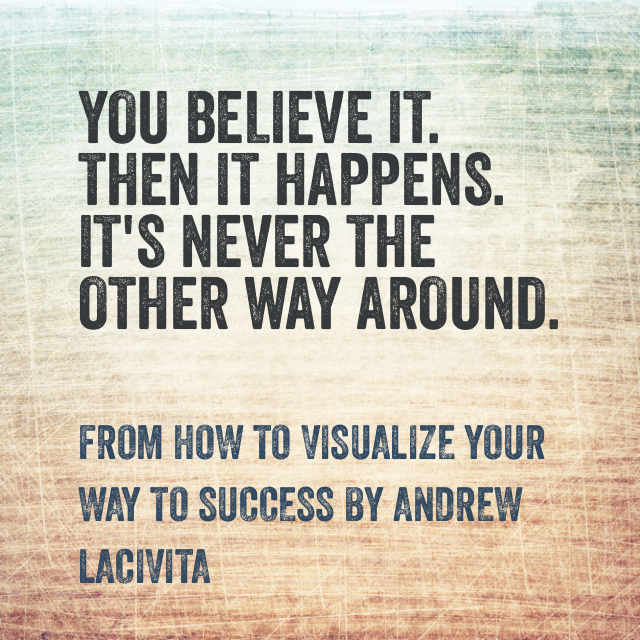 Today, I want to talk about a daily exercise I’ve practiced religiously—visualization. 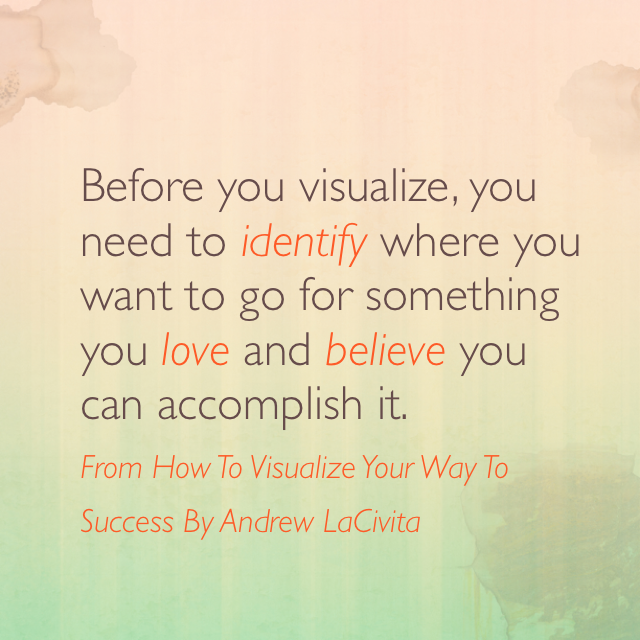 And, provide some insight into how to visualize your way to success. Five minutes of this every day will improve your life dramatically. When did that gray hair and eye wrinkle show up? I never notice my face change from day to day. Only when I look at pictures from a few years back can I see the transformation. Much of your life is like this. Your career is like this. Your marriage can be like this. While most people prefer to slow the aging process, many want to accelerate their lives and careers. Much like the unnoticeable change with age, your progress from day to day becomes imperceptible. Oftentimes, you’ll feel better about your advancements if you take time to look back at where you were one, three, and five years ago. That’ll help your psyche a bit. I’m sure many of you are like me. You feel where you’ve been is history. You care more about getting where you’re going—and you want to get there in a hurry! 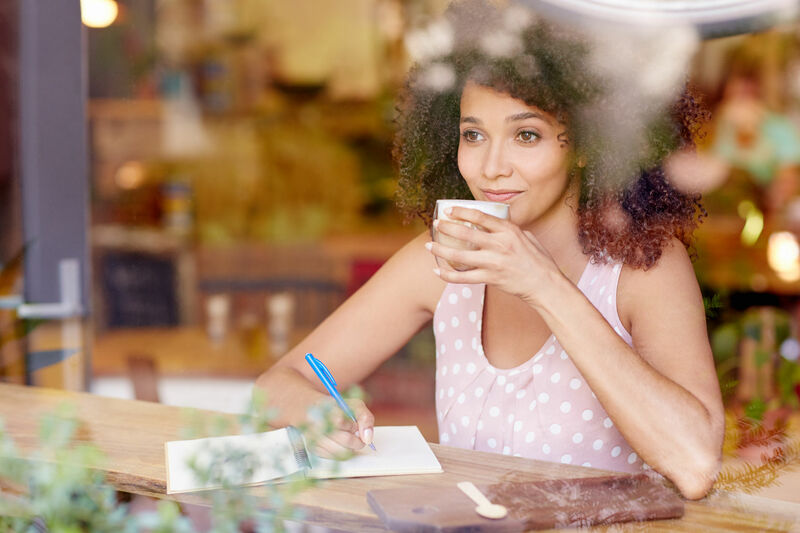 First Step: Before you look forward, take a deep breath and spend a few moments realizing (yes—realizing) how far you’ve come and all you’ve accomplished. In fact, spend a few minutes every day doing this. What’s the best way to get from where I am to where I want to go? Make sure you’re working toward something you love. Believe you can accomplish it. Identify. The first is you’ll get where you’re going faster if you know where you want to go. It also helps to know where you are. Don’t laugh. Most people are in a much better starting position than they realize. Love. 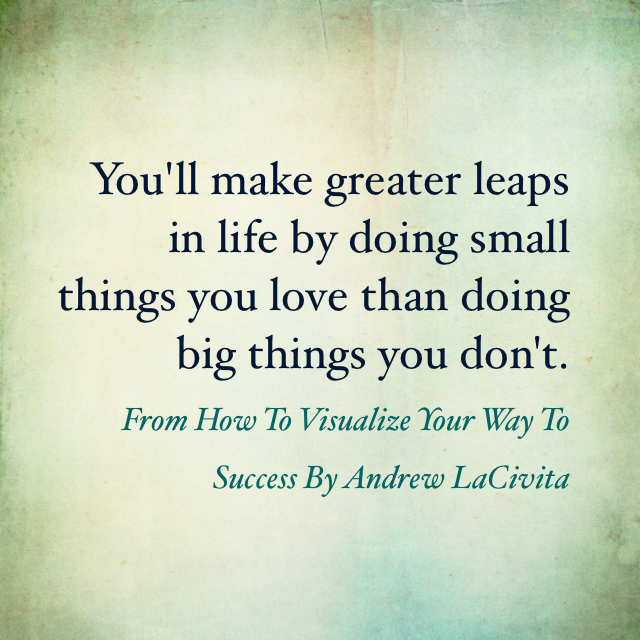 The second is you’ll make greater leaps in life by doing small things you love than doing big things you don’t. You need to enjoy yourself each day because your passion and optimism will fuel getting things done. 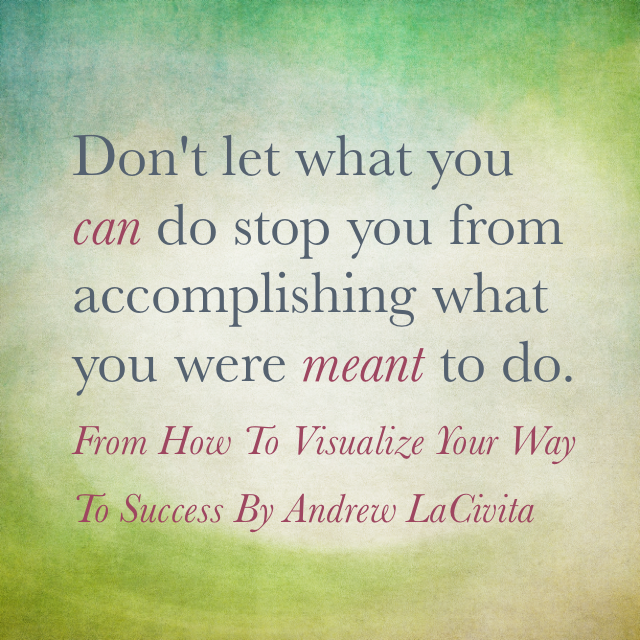 Most importantly, don’t let what you can do stop you from doing what you were meant to do! Believe. The third is you need to believe you can get there and be unafraid to jump in! At least once a day, I think about this fantastic quote from American Naturalist and Essayist John Burroughs. He said, “Leap, and the net will appear.” (If you’re really ambitious, check out The Art of Seeing Things: Essays by John Burroughs and You’ll See it When You Believe it by Wayne Dyer.) You believe it. Then it happens. It’s never the other way around. Okay antsy pants. Visualize yourself at your end-state even though you don’t know how to get there. Imagine yourself at your “destination.” What’s it like? How does it feel? How does it sound? What will the end-state allow you to do? Imagine this for five minutes. It’s okay to dream, but you’re more likely creating a reality. “Five minutes” means you can do this in the shower, on the train, or wherever. It’s best to do it in a quiet location. This visual of you in all your glory will have pull power—it’ll feel like it’s pulling you toward it. In actuality, you’ll be pushing yourself toward it one step at a time. 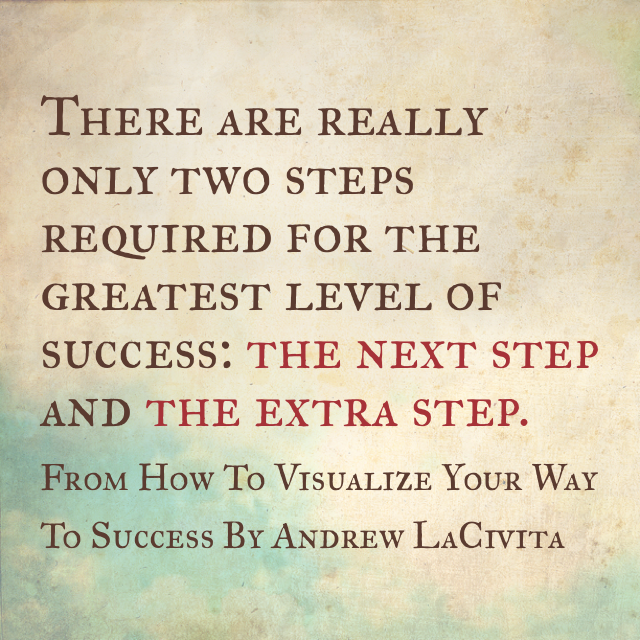 There are really only two steps required for the greatest level of success: the next step and the extra step. 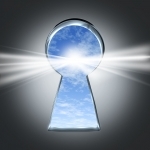 You simply need to know what you need to do next to move toward your destination. Putting a little extra effort along the way will separate you from the masses who are unwilling to do that. Picture the end-state, what it’s like, how it feels, how it sounds, and what it will enable you to do. You need to do this repetitively as you work toward this transition and evolution. That will help you do this one-day at a time. Then take what you’ve identified as the next step. And take it. One step at a time. 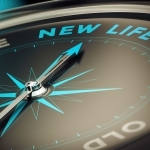 One fantastic resource to help you visualize your future is Living Forward: A Proven Plan to Stop Drifting and Get the Life You Want. It’s a great book by Michael Hyatt and Daniel Harkavy. I hope you enjoy it. As always, I’d love to hear you: What are your best techniques for progressing in life? I knew when I started; I could help many by working with them to secure new career opportunities. I’d also provide guidance to others who I couldn’t “place” in new jobs. This combination of people numbered in the several hundreds in my first year in business. Good start! At this point, I started visualizing myself helping tens of thousands. I imagined it even though I didn’t know how. More phone calls wasn’t the answer because there simply wasn’t enough time. As I continued to visualize over the years, the number of people I’d help kept growing. I wanted to help hundreds of thousands or perhaps millions of people. I started to envision ways to communicate with them—blogging, writing books, and speaking. Then I just started doing those things, even if I wasn’t proficient yet. Before I knew what hit me, I was on the radio and TV. How did that happen? I began visualizing speaking to larger audiences. I would need to reach these people more easily. Better yet, can I figure out how to get them to find me? What’s this social media stuff? 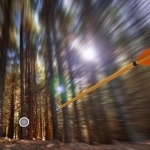 What are Search Engine Optimization, Webinars, and these other mediums? As you witness the transformation, your visualizations become more real. The picture becomes clearer. Most importantly, you need to believe in your ability to make it happen. You believe it. Then it happens. It’s never the other way around.